As a homeowner, you may decide it is time to sell your house. This might come about because you want to upgrade to something bigger for your growing family, downgrade because your children have flown the nest, or head to a new location. You may also be forced to sell your house to divide your assets during a divorce. Once you find a potential buyer, you might feel like you are well on your way. However, there are a number of difficulties and circumstances that can arise during the home sale process that may force you to back out of a residential sales contract. You have to be careful. If you try to back out without a valid reason or without taking the proper steps, you could be on the line for financial damages. To avoid making an expensive misstep during the residential sale process, hire an experienced West Palm Beach residential real estate attorney from the Law Offices of Larry E. Bray, P.A. The first option for backing out of a contract to sell your home is to look for a lawful means of doing so. You and your attorney will carefully review the contract and see if there are any provisions the potential buyer has violated or not fulfilled. If the other party has not upheld his or her end of the bargain, then you may be able to lawfully opt out of the contract and walk away from the deal. Also, if you and the buyer cannot agree on essential terms, the contract may be voidable. If it comes down to the fact that you and the buyer cannot agree on the final price or how repairs will be conducted, you may both be able to walk away. Unfortunately, there may be situations in which you cannot or do not want to sell your home, yet you do not have a way to lawfully back out of the contract. In this difficult situation, your attorney may need to have an honest conversation with the other party. Sometimes, all it takes is explaining the circumstances. For instance, if the home you were supposed to buy did not work out or the job in another state fell through, you need to keep your house. An understanding buyer may agree to break the contract and move on. If a frank conversation does not work, you can look into buying your way out of the contract. If you are locked into the residential sale contract but have decided you truly want or need to keep your house, you may be able to offer the buyer a settlement to walk away from the contract. This could compensate the buyer for his or her financial injury, including the time and money it took to participate in the sale and to find other living arrangements while looking for a new home. 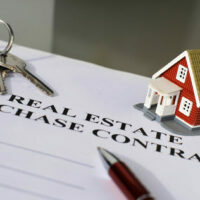 If you have gotten into a residential sale contract you want out of, call us at the Law Offices of Larry E. Bray, P.A. at 561-571-8970 as soon as possible. Our West Palm Beach attorneys are eager to assist you throughout each step of your case.